This blog is now located at http://blog.quiltingonline.co.uk/. Pennants4Patchworkers is the fundraiser for The Quilters' Guild at the Festival of Quilts in August (August 20th to the 23rd At the NEC, Birmingham) and is being "masterminded" by The Miniatures Group. The pennants can be any size from A4 downwards, but don't have to be miniatures. The A4 Pennant should be an isoscelese triangle (the two angle sides the same length and angle from the upright). It should be 3 layers, quilted and finished appropriately. 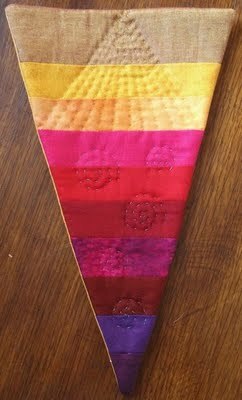 Go to the website: http://pennants4patchworkers.wordpress.com to see ideas, patterns, photos and lots more examples some of which we have posted here. 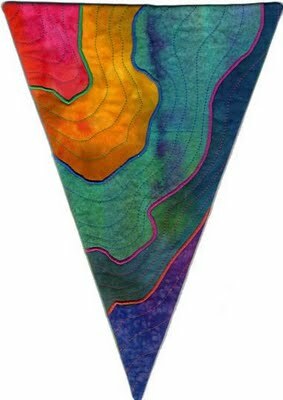 If you make a Pennant and want to drop it off at Quilts UK at the Malvern Three Counties Showground (13th to 16th May 2010) why not bring it along to The Cotton Patch stand - (just to the right of the entrance). 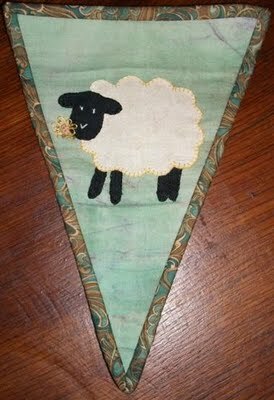 Judith Dursley who is co-ordinating the Pennant collection will pick them up from us on the Sunday of the Malvern show. If you find an uncontrollable urge to keep making pennants (we also have felted pennants courtesy of Gillian Glad Rags which you may wish to try) we have just had information on Quilts 4 London which is a National Olympic Textile Project supported by Lynne Edwards, Gail Lawther, the Batik Guild, The Cross Stitch Guild, The International Felt Makers Association, the Quilter's Guild of the British Isles and UK Hand Knitting - visit their website or contact Irene Heathcote at admin@quilts4london.org.uk for more information. The idea is to make an A3 Pennant (12" x 16") using any Textile Technique - 12,000 are required and each 2012 Olympic Athelete will receive one! For YouTube links. ideas, and co-ordinators details visit their website. 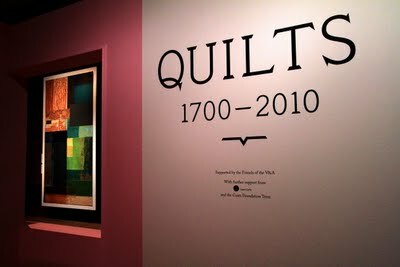 There were so many beautiful quilts and here are a few more from the Quilts 1700-2010 Exhibition at the V and A. View towards Changi Quilt, made by Girl Guides held at Changi Prisoner of War Camp in Singapore for their quilt leader - beautifully presented with toile quilt in the distance. Channel 4 has an feature on the quilt with a video you may wish to see. The Red Cross Quilt and detail. Quilt made from blackout curtains and sateens. This photo shows some of the amazing pieces that make up the whole. A huge amount of work must have been involved in the design and execution of this piece. 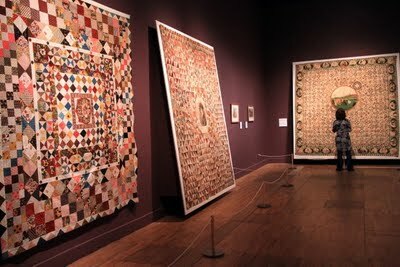 These quilts are all in the first section and for those who loves historical quilts are a really superb collection. I really should be doing some accounts...so...more photos to follow soon. The quilt detail shown below is from George III Reviewing the Troops (1803-1805). The construction is technically brilliant and reveals details of the makers life and her social and cultural background. 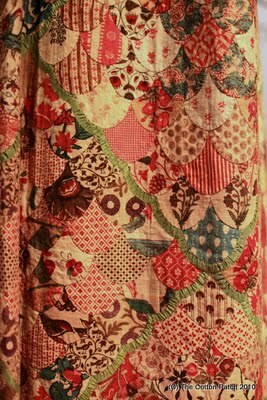 This detail shows just a small section of the quilt below the main centre circle of George III. Vignettes made up of between 23 and 45 patches, hand-drawn inscriptions and embroidery form a border surrounding pieced circles. 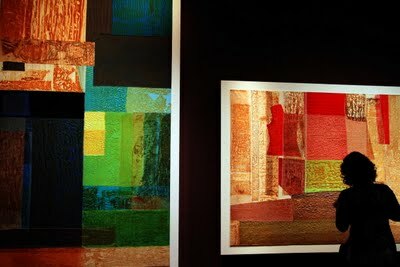 The quilting on this one showed up beautifully in the subtly lit gallery and again displayed bed-style. Quilts 1700-2010 opens at the V&A on the 20th March 2010 and runs through until the 4th July 2010. Apparently this is the most successful exhibition that the V&A have run in terms of pre-sales of tickets - over 9,000 at the last count. We were delighted to be invited to the Preview yesterday and even more so after we had viewed the exhibition - the scope and depth are excellent and even if you don't think that the highlights of the exhibition should be the Tracey Emin bed or the Grayson Perry foetuses you are sure to find elements that find you in awe of their makers or at the very fact that you are viewing these quilts at all. The oldest quilts are in breath-takingly good condition. I own a Crazy Quilt from 1893 and some of the satins (especially the reds) have practically disappeared. The 1730-1750 patchwork bed hangings which greet you as you enter the exhibition are the only set of chintz bed hangings from this period that survive in a public collection. They are in superb condition - the colours bright, the work extraordinary with a clam shell design that comprises 6500 individual patches. 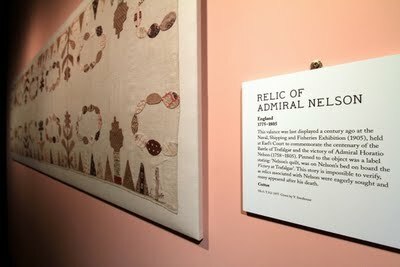 So this is where the exhibition opens - in the 18th century ..." when increased access to fashionable materials such as silks, satins and velvets resulted in an explosion of sumptuous patchwork quilts created for some of the wealthiest homes in Britian." Thought-provoking themes guide you through the quilts and explanations of each quilt (expounded in great depth in the book for the exhibition by the Curator Sue Pritchard) unravel the stories behind each of the quilts, sometimes complex narratives where all is not as it may seem (typed in error seam there....) from initial inspection. These are a selection of my photos from the exhibition which I hope you enjoy. When time allows I will give more information on some.